People flock to Northern Israel for a quiet respite and break from the hustle and bustle of the big cities. On your way up north, to the Galilee or the Golan, stop, take some time and discover some popular spots and some that are off the beaten track. The Ghetto Fighters' House or The Itzhak Katzenelson Holocaust and Jewish Resistance Heritage Museum was founded in 1949 by Holocaust survivors and members of the Jewish underground in the ghettos of Poland, and veterans of partisan units. It is a place that tells the story of the Jews during the 20th century and during the Second World War. The Ghetto Fighters’ House was the first museum in the world to commemorate the memory of the Holocaust and Jewish resistance. The Yizkor Hall allows the public access to the archives and art collections for viewing. Names of the communities from which Jews were taken to their deaths are displayed here to. The Ghetto Fighters’ House is located on the Coastal Highway (Route #4) between Akko and Nahariya. Bus No. 271 from Haifa-Mercazit ha-Mifratz to Nahariya or "sherut" to the stop opposite the Ghetto Fighters' House. You can also take the northbound train to the Akko station; continue from there on the Coast Road by bus or taxi – both leave regularly from the "Egged" station which is approximately a five minute walk from the train station. Many primary schools introduce their pupils to the Holocaust by taking them on a visit to the Yad LeYeled memorial museum. Go with if you can. Guided tours in English, German, French, Spanish, Portuguese and Russian. Wheel-chair friendly. Hearing impaired visitors can borrow a device, worn on the neck, that transfers the words of the guide or the personal audio guide to their hearing aid. Three cheers for that! From Lisa K: "I have been visiting Akko for over 20 years with guests from abroad and only recently I discovered the Tunisian Synagogue. I am sure there is no other synagogue like it in the world. The 4 story building is covered with mosaics from floor to ceiling. This place takes your breath away. Our guide for the day, who is also the Beadle, founded the synagogue over 60 years ago. He speaks Hebrew with a heavy Tunisian accent which was sometimes difficult to understand. His stories and explanations were fascinating though. I don't think he speaks any English at all as he asked me to translate for my guests. The other visitors that were there that day, all had English speaking guides. Scenes of ancient Israel, the Twelve Tribes, Jewish symbols and more decorate every surface; walls, floors, ceilings, stairwells and handrails. Panel after panel of mosaics. The Beadle said that the design ideas just come to him. The doors to the main Ark (on the second floor), are made of silver and engraved with text and blessings. You don't really need a guide to take in the beauty of this place." A short taxi ride from the central bus and train stations. The sherut stops on the main road, just a couple of blocks away. Ladies, make sure your shoulders are covered and that you are dressed modestly. Gentlemen are required to cover their heads. Bring your own kippah. There is a gift shop. Buy their album with color photographs and explanations (5 language options) for around 100 Shekels - makes a great gift or memento. Step back in time into the unique atmosphere of a lost world recreated - life in the Jewish Shtetl. See how some of our ancestors lived, worked, cooked and celebrated. You can see the tools and implements they used, household furnishings typical of the time and experience the sounds of Yiddish and traditional songs. 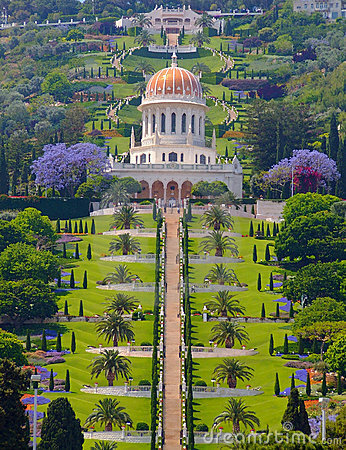 The Bahai Temple is probably Haifa’s most popular attraction. There are 4 options for viewing the grounds. The first is a visit to the Temple (Shrine of the Baab) on Sderot HaZionut. The second is from the lookout on Yefe Nof Street in the Central Carmel, the third is a pre-arranged tour of the terraces which starts on Yefe Nof and the fourth is a spectacular view from Ben Gurion Blvd in the German Colony. This tour operates daily, except Wednesdays - see schedule. It is free of charge and no reservation is needed. English tours are at midday. No entrance fee. There are lots of stairs on the terrace tour, wear comfortable shoes and take plenty of water with you. Think carefully about taking young children on the terrace tour – once you begin there is no going back. The Madatech - The Science and Technology Museum,The Tikotin Museum - The Japanese Art Museum, The Haifa Museum of Art, The National Maritime Museum, The Haifa City Museum, The Mane Katz Museum are just a few of the many world-class museums in the city. The permanent and and ever changing temporary exhibitions will delight your entire family. The cable car travels from the lower station at Bat Galim to the upper station at Stella Maris in the French Carmel. From the three cabins, you have a panoramic view of Haifa and the bay. Take Bus nos. 41 and 42 from Bat Galim and 25, 26, 27, 30, 31 from Stella Maris. Free parking is available at both ends. Hours of extreme activities and fun for the kids:- wall climbing, bridge rope park, omega (rappelling), paint ball, skate boarding, bungee and free climbing. Getting there: By car, on Flieman St. (a continuation of Freud) next to the Congress Center opposite the Kenyon Haifa/haifa Mall. Bus numbers: 3, 113, 114, 115, 125, 133 stop at the center. Kenyon Haifa is also a 10-15 minute walk from the central bus station and from the train station at Hof HaCarmel. The Haifa Zoo at 124 HaTishbi Street is built on the slopes of Mt. Carmel. It is a small zoo and is very compact. It is home to a variety of animals and indigenous fauna and flora. Walk through the bird cage; take in the dark bats cage and the petting zoo. 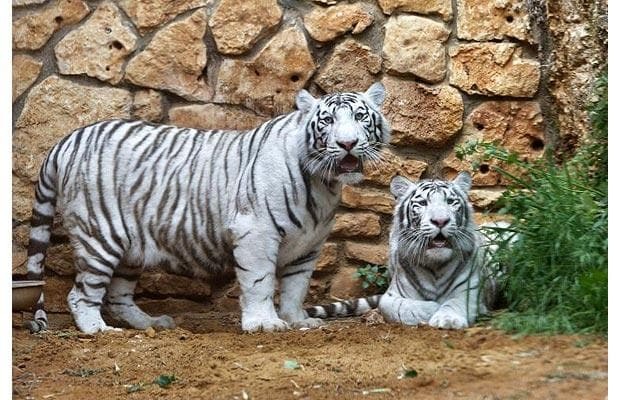 White tigers, camels, Syrian bears and antelope from the Judean Hills and the Negev are just some of the local wildlife to be found. Entry into the zoo closes an hour before final closing time. You can combine your trip to the zoo with a stroll down Wadi Lotem. Starting in the Central Carmel the Wadi winds down the mountain, via the thicket, through some of Haifa’s suburbs. The Wadi is at the southern corner of the Gan ha Em (see below) on the left of the events platform. The walking tour, demarcated in blue, is about 2.5 kilometers long and finishes In the Sha’ar ha Aliyah neighborhood, in the public gardens. The Wadi is host to a variety of trees, shrubbery and flowers. The Hai Bar is part of the Carmel Forest National Park. The animal sanctuary aims to restore Israel’s wildlife and has re-introduced numerous native species to the area. Entrance on Saturdays only from 08:00 – 16:00 and the entrance fee to the Hai Bar, is per vehicle. You can buy an annual membership – Matmom - from the Israel Nature and Parks Authority. This is really worthwhile. You get free entrance into most of the parks and 50% discount to others. Some credit card companies have a deal where you can trade your points for part of the cost of the card. The Matmon is also available at many of the site entrances. Tourists can buy a similar card called "The Green Card. For 80 shekels you get entrance to 6 sites operated by the Israel Nature Parks Authority. Call *3639 for more information. Visit the forests in the spring to enjoy the masses of wild flowers. The northern port cities of Haifa and Akko are set to be connected by Israel's first pleasure cruise; cruise will enable tourists to stay in Haifa, and bypass all the traffic as they travel to Akko by sea; the trip takes 25 minutes, and costs NIS 30 one way, NIS 55 for a return trip. This sounds like a fun way to get to Akko and take in the sites, the Old City, the market and eat at one of Israel's most famous Hummous restaurants - Said's. A great way to entertain your overseas guests too.